After spending a little extra time in the mirror this morning, you finally have to admit that your teeth are noticeably stained. White teeth are a powerful signifier in today’s society, and if you’re looking to turn back the clock for your smile, Dr. Cowell can help you do it in the most effective and safe way possible. 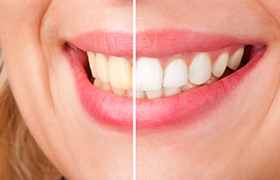 Our practice is proud to offer both in-office and take-home professional teeth whitening with Zoom! and Ultradent. With these treatments, you can either get complete results in just an hour at our office, or we can give you your own custom-made kit so you can whiten while you surf the web or watch your favorite show. Both approaches are proven to deliver dramatic results, and they’ll make you more than eager to show off your pristine smile. Which one is best for you? We can help you find out today, so contact us for an appointment.